Tsukuba, Japan – Sleep is vital for adequate functioning across the animal kingdom, but little is known about the physiological mechanisms that regulate it and the reasons for natural variation in people's sleep patterns. In this study performed by researchers at University of Tsukuba, the team built on their previous work of subjecting mice to a mutagen, screening them for sleep disorders, and then identifying the causative mutated region. 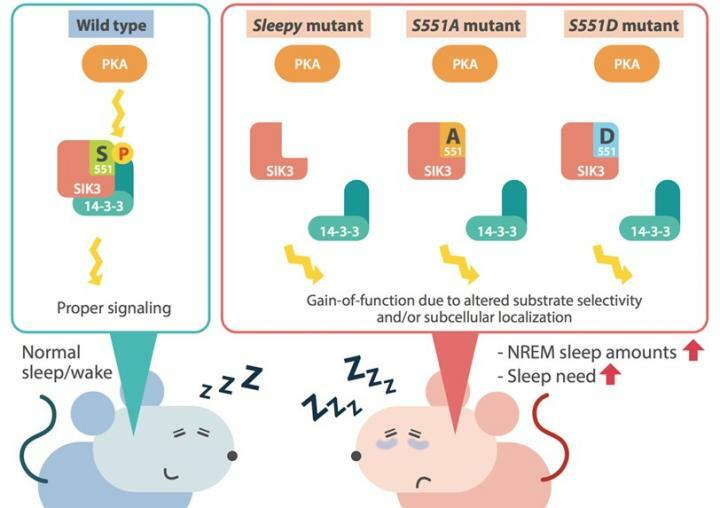 Here, the team produced a mutation at a specific position in a protein called SIK3, and then examined the effects on sleep, including durations of wakefulness and sleep, as well as the brain activity reflecting periods of dreaming and non-dreaming sleep, and alertness when awake. The results showed that changing the 551st amino acid of the SIK3 protein caused longer durations of non-dreaming sleep as well as an increased "sleep need," reflected in particular patterns of brainwave activity when both asleep and awake. The mice were also awake for shorter periods during the night, when they are usually active. "The findings were particularly interesting in that this mutation affected the periods of sleep lacking rapid eye movement, the largely non-dreaming part of sleep, while rapid-eye-movement sleep was largely unchanged," coauthor Masashi Yanagisawa says. "This showed that SIK3 is involved in very specific sleep-related regulatory mechanisms." The team also focused on the molecular mechanisms by which the mutation exerted its effects. They found that the mutant form of SIK3 cannot bind to or modify other molecules called PKA and 14-3-3 proteins. This would prevent downstream signaling events, ultimately impacting on the system regulating the sleep/wake cycle. "The features of this amino acid in this protein are evolutionarily conserved across the animal kingdom, so these findings are also relevant to studies on sleep in humans," lead author Takato Honda says. "For example, in the condition idiopathic hypersomnia, patients experience a strong need to sleep and are sleepy during the day, like the mice in our study. Our work could help to explain why."